Vienna is the capital and largest city in Austria, and as of 2001, the entire town was designated a UNESCO World Heritage Site. It has been named the "City of Music" or the "The City of Dreams" and for good reason. Vienna is home to some of the most interesting architectural masterpieces in Europe. While Vienna might be a big, bustling city, its historic centre is rather small and easily explorable by foot - the best way to get in touch with the feeling of this remarkable city. Modern buildings intertwine with gothic gems. While some historic towns feel like they are trapped in the past, this city embraces antiquity but still feels a part of the modern world. 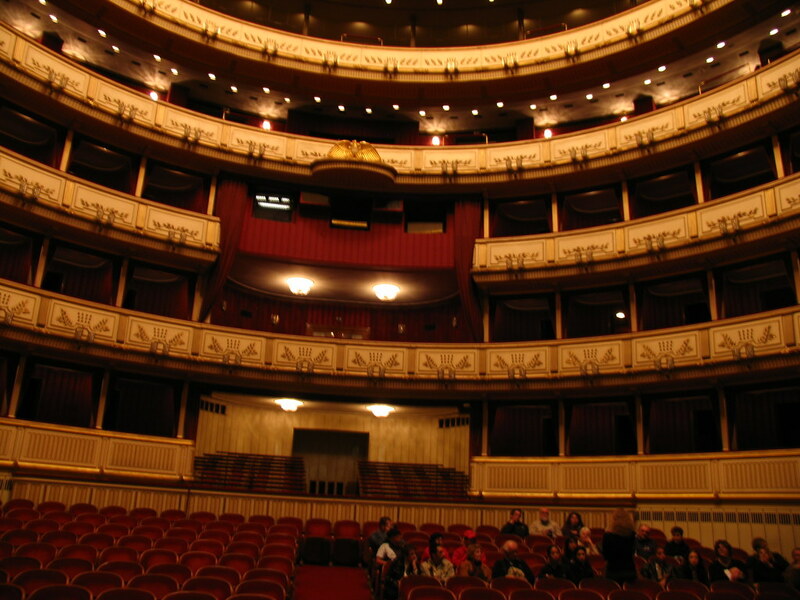 Start your tour at the Vienna State Opera House. In the City of Music, there is no better place to start than the Opera. The Opera House opened in 1863 and since then has been home to some of the most world-renowned artists, musicians and directors. Every year there are over 350 performances from over 60 different operas and ballets. The facade of the Opera House hasn't changed since 1869. Neo-Renaissance style arches and a huge veranda pops out onto the Ring Road and offers the public the chance to use the building as shelter from the rain or even just a shady pathway throughout the year. 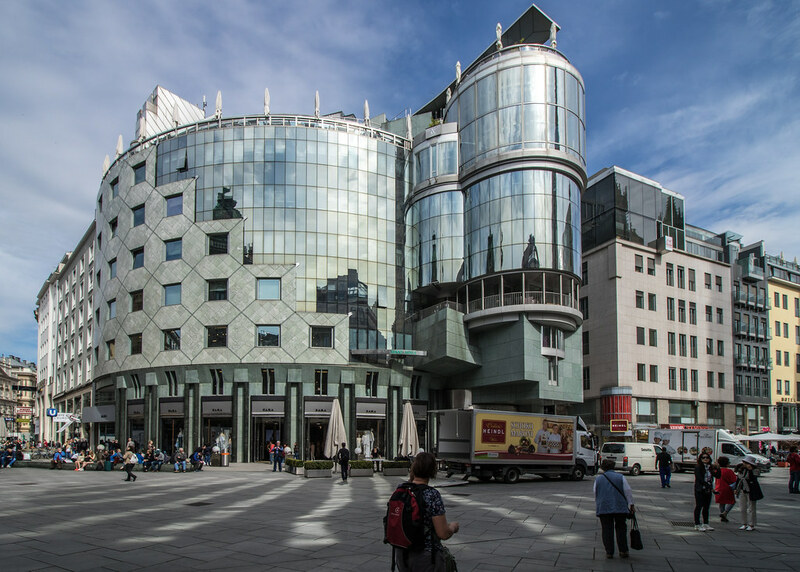 This integration of the building into the daily lives of people in Vienna also cemented its prominence as a piece of architecture in the hearts of its residences. The bronze statues which top the building represent Erato’s two winged horses named Harmony and Poetry. Above each of the arches along the outside are five statues representing heroism, tragedy, fantasy, comedy, and love. There are also two iconic fountains on their side of the opera house which depict the two worlds which music can create; one representing dance, joy, and levity, and the other seduction, sorrow, love, and revenge. Deep in the bones of this building, you will find veins of Vienna's past. The arts were such a huge building block of Vienna's culture. It was here that Mozart wrote the famous opera The Marriage of Figaro. The city was home to many great composers of the classical music era, during the early 19th century, such as Joseph Haydn and Ludwig van Beethoven. You can get a behind the scenes tour which will take you backstage with a guide who will tell you all about the history of the opera house. If you'd rather watch a performance, tickets range anywhere from 8€-130€, but if you wanted to save money, you can purchase day-of standing room only tickets for as little as 2€. Café Sacher is a legendary restaurant. 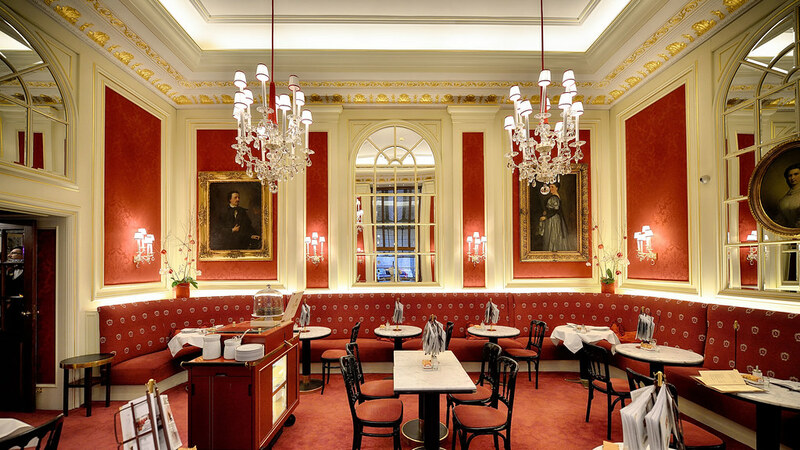 Located inside the Sacher Hotel, the cafe has stood in the same spot, serving the people of Vienna for over a century. Stepping inside the large entry doors, you are welcomed into a stunning Marie Antoinette-inspired dollhouse. Deep red painted walls are accented with bright white linens and sparkling golden chandeliers. The crown moulding is covered in gold leaf and acts like icing on top of a cake. Cafe Sacher is famed for their invention of the Sachertorte, made in 1837 for the presiding Viennese prince. There is no better place in the world to sample this uniquely Viennese treat. The Sachertorte is made by combining two layers of airy chocolate cake, separated by apricot jam, coated with chocolate ganache and topped off with whipped cream. The cake itself is quite dry, so the whipped cream and a cup of warm coffee or tea is the best combination to enjoy the dessert to its fullest. Down the street from Cafe Sacher is Albertinaplatz or Albertina Square. Albertinaplatz is met on six sides by six different roads, making it a favourite meeting destination for the people of Vienna. From the square, you can see or visit the Albertina Art Museum, St. Augustin Church or the Austrian Film Museum. In the centre of the square are various powerful statues and monuments. Before 1945, wealthy apartment blocks covered this square. But during WWII they were all subsequently destroyed in an air-raid. The numbers of deaths could never be verified, and the bodies could not be recovered from the rubble.All the statues now standing here, use stones similar to the ones pulled from the wreckage. Standing amongst the statues, almost beneath them, you can imagine how much carnage huge falling piece of stone would have caused. The Gates of Violence stand in the centre of the square and are the most imposing piece. They are made from the same material which was used to create stairs inside many of the infamous WWII death camps. The great stone is split in half, a powerful image symbolic of how war can break apart even the strongest things in this world. Embedded in the stones are images of war, gas masks, men and women caught in their moment of death, medical experiments, chained victims and weapons of war. It is a stirring and honest depiction of the horrors of war. Another piece of sandstone displays a muscular man with his head buried in the stone. This piece is called Orpheus Enters Hades. It is meant to remind all those who pass by that ignorance leaves you as guilty as the rest. A bronze statue lays almost flat on the ground. It is the image of a jew covered in barbed wire. A reminder of the degradation and humiliation that the Jews suffered in Vienna even before WWII. A weak arm is outstretched towards you, asking for help and one only wishes you could tear the copper wries from his body to set him free. The Stone of the Republic is a replica of the 1945 declaration that established Austria's second republic and helped protect the human rights of all its citizens. It is the best piece to finish on as it is a hopeful message to end with. Although these statues are very emotional to view, I think they are very important to see as we need to understand the entirety of Vienna history; the good, the bad and the ugly. Kärntner Straße or Carinthian Street is the most iconic shopping street in Vienna, frequented by so many people that it has been turned into a pedestrian-only zone. People can walk up and down the street from Karlsplatz to Stephansplatz without fear of running into traffic. The pedestrian zone creates this gorgeously open space. Even when hundreds of people are out and about it feels relaxed and unemcumbered. The Kaisergruft, inside the Capuchin Church and Monastery, is home to the Viennese Imperial Crypts. Since 1618, the deceased members of the House of Habsburg have been buried here in ornate urns and opulent metal sarcophagi. While it might seem a bit macabre to explore the tombs, the resting places of the kings and queens of Vienna are more like a work of art than a graveyard. 107 metal sarcophagi lay beneath the church, along with five heart urns. The more significant the person laid inside the more magnificent the tombstones. The prominent members of the royal family's tombs are made of pure bronze while some of the more lowly members are made of cheaper, tin alloy, coated with shellac to appear to be bronze. In the 19th century, some of the tombs were even cast in silver and covered in gold plating for an even more expensive appearance. The study of metalwork throughout the ages is on display here just as much as the dead who lie beneath their masterpieces. When the bodies were buried, most of their organs were removed since the tombs would be free-standing and this would result in excessive putrification of the organs in the basement of the church. The heart was often saved and placed in an individual silver urn atop or beside the tomb. Most of these urns were sent elsewhere, perhaps to stay with the family while their bodies lay to rest here. The most incredible piece is the Sarcophagus of Empress Maria Theresia and Emperor Franz I Stephan designed by Balthasar Ferdinand Moll. This extravagant double sarcophagus in Rococo style featured the pair, as they would have appeared in life, lying on top of the lid, as if awakened from their slumber. They stare at each other, and their features are so lifelike one is almost skittish as you walk by. Their tombs, like many others, features scenes of critical moments in their lives surrounding the perimeter. The shrouded figures represent the grieving states which they ruled over in their time: Holy Roman Empire, Hungary, Bohemia and Jerusalem. They now rest at peace underneath a domed fresco, heavenly pink and blue painted clouds floating eternally overhead. While it might be called the New Market this square is anything but new. It was first established as the primary market in Vienna in 1234 when the old Hohe Markt was no longer large enough for the needs of this growing medieval city. In the centre of the square stands the Thunder Well. The Thunder Well was created in 1739 by artistic Georg Raphael Donner. The bronze statues which surround the fountain are copies of original sculptures which are now housed in the Austrian Gallery Belvedere. Surrounding the square are several pastel coloured architectural masterpieces. #10-11 is where you'll find a house which once was home to a traditional delicatessen. It was built by Arnold Heymann in the Old German Renaissance style. Today you can visit the new owners who still run a delicatessen business out of the storefront. Further down the street, you can find the Mayseder house at #15. This is the oldest house on the square, built in 1548, and now is home to a fancy jewellery shop. In sharp contrast to the houses along the New Market, the Haas House is a postmodern dream of architect Hans Hollein built in 1990. Today it is part retail and part restaurant so if you wish to dine inside you have the chance to eat within an architectural star. 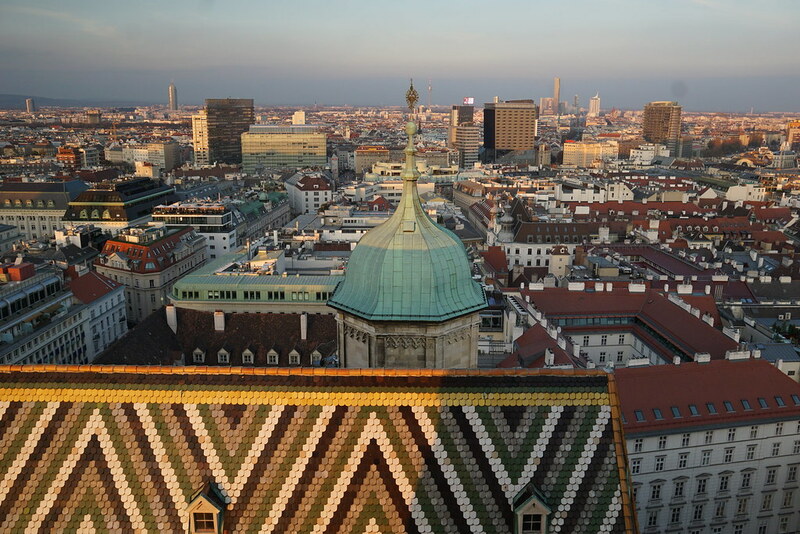 Without a doubt, the most visited building in Vienna is St. Stephen's Cathedral. The original church was built here in 1137, but after being ravaged by fire, a new church was constructed atop its literal ashes. The current incarnation is a mixture of Romanesque and Gothic influences built in the 14th century. The most impressive and unique feature of the church is the brightly coloured tile roof. Over 230,000 ceramic tiles create the stunning rooftop mosaic of the imperial double-headed eagle. The double-headed eagle is the symbol of the Habsburg Monarchy who ruled over Vienna for centuries. A double-headed eagle in Rome symbolized you weren't merely an imperial ruler but a divine one, blessed by the Pope. The iconic roof was the only part of the church to be damaged during WWII. Although there were official orders to fire upon the church until all that was left was rubble, those orders were dismissed. Perhaps the sheer power the church commanded caused those who would destroy it to betray their orders. During the Soviet occupation of Vienna, fires were set in the shops opposite the cathedral and, unfortunately, they spread and set fire to the church roof. Tiles crashed to the floor, but due to the dutiful efforts of their clergy who piled protective bricks atop their precious statues and monuments inside, nothing was too severely damaged before they could put out the fires. The church's tower overlooks over the entire city, watching over it like a dutiful guard. The tower is named Steffl and stands a staggering 136 meters high and is home to one of Europe most massive bells, which is etched with the face of the mother of god. It is a legend that when Beethoven was a child, he first became aware of his deafness when he stared up at the tower and saw the birds flying away as the bell began to ring but Beethoven himself couldn't hear a thing. The Giant Gate or Riesentor is your entry into the Cathedral. This gateway was part of the original Romanesque church, built in 1223, which was subsequently burned down. The name for the gate came from the discovery of a mastodon bone found beneath the church discovered in the 14th century. Before modern science, people believed that giants roamed Europe and that these mastodon and dinosaur bones were remanents of that great race. Although you can view the church from the square surrounding it, you must make the effort of going inside to visit. When you first enter there is an area which is free. To go further inside the nave will cost you, but the price is so minimal and more than worth it. Many day-tripping tourists will walk inside, snap a picture and walk right back out. The entry is so crowded but once you pay your €5,50 (Child: €2,00) the crowds disperse and all that is left is the immense beauty of the overwhelming columns, sparkling stained glass and monumental paintings. As you walk through the church take a moment to study the gothic columns. Each one of them is home to a beautifully carved saint under ornate canopies. At the base of each column is a cluster of a richly pigmented paintings. The magnificent stone pulpit, created by Niclaes Gerhaert van Leydenm, is a gothic masterpiece, which encircles one of the support columns like a stone tentacle. There are six chapels is total which are on either side of the nave. Each one dedicated to a different saint; Saint Barbara, Saint Catherine, the Chapel of the Cross, Saint Eligius, Saint Bartholomew, and Saint Valentine. If you are feeling up to it, and I suggest you muster all your energy, take the time to climb the 342 steps up the South Tower. The steep and narrow ancient staircase will lead you up 246 feet to a lookout which provides one of the most stunning views of Vienna. After touring the church, you might want to chill out with a walk along the Graben. The Graben is Vienna's Rodeo Drive. The word Graben means "gutter" as this area was once on the edge of the city walls, where the refuse would be thrown into the outer city moat. Today, it couldn't be further from the gutter. Along this street, you'll find some of the most expensive shops, exclusive retail, traditional delights and fantastical architecture - both old and new. In the mist of high-end shops and expensive cafes and restaurants stands one of the most impressive Plague Columns in Europe. Plague columns were erected after plague was wiped out from the city. It was a monument of perseverance in the sight of great pain and suffering. Topped with the Mother of God, this Plague Column was also dedicated to the Brotherhood of the Holy Trinity who created plague hospitals to care for the infected. Vienna suffered as many as 75,000 dead during their great plague in 1679. Vienna was spared much of the 14th-century plague but was ravaged when it returned in the 17th century. Although medicine and sanitization techniques were improving much of the treatments for the epidemic were still a mix of religious prayers and outlandish medicine. The column is 69 feet tall. At the base, we see the figures representing faith triumphing over disease. The middle portion has the visages of Emperor Leopold I and is topped with golden cherubs flying around to protect the Mother Mary. The Peterskirche or St. Peter's Church sits on the corner of the Graben. The earliest church built on this site dates back to the early middle ages, but because nothing remains of that original structure, the church has lost its title as the “oldest church in Vienna”. The current iteration of the church was designed in Romanesque style, initially built in 1137 but redone in the 1700s after fire and plague ravaged the structure. The interior design of the church was inspired by the Vatican in Rome. When you step inside, you are swept up in a warmth that is almost ethereal. The church uses lots of pink and red marble as well as gold stucco throughout to create this welcoming radiance. A dark, baroque painting covers the massive dome and in the cupolas are frescoes representing the Coronation of Our Lady. 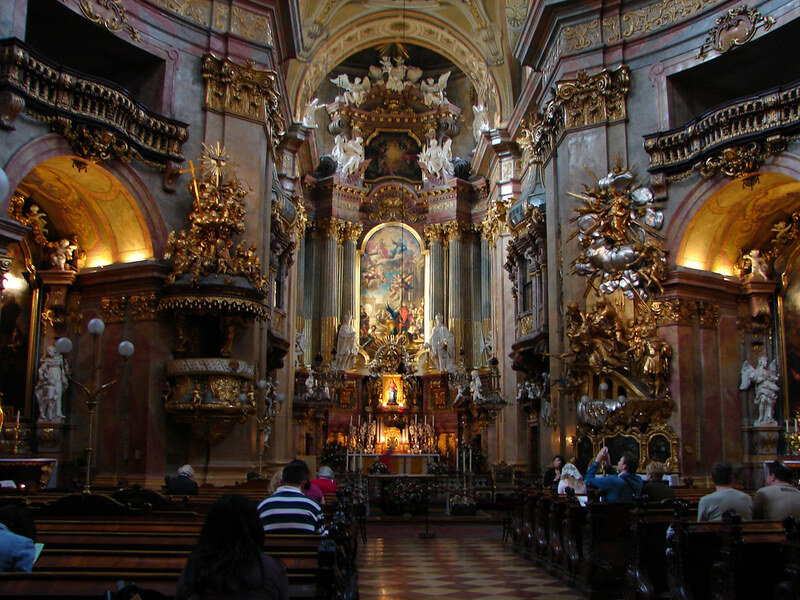 The high altar might be one of the most stunning church altars in all of Europe. Walking up to it, your head cranes upwards, towards the heavens. Four columns on either side flanks a beautiful Viennese painting of the Healing of the Lame by St. Peter and St. John in Jerusalem by Martino Altomonte painted in the 16th century. If you continue to look upwards, you'll see a smaller, circular painting of the Immaculate Conception, painted in the 19th century by the artist Kupelwiese. The rest of the altar was created by Antonio Galli Bibiena and is a testament to his skill at creating scenes in gold and silver. 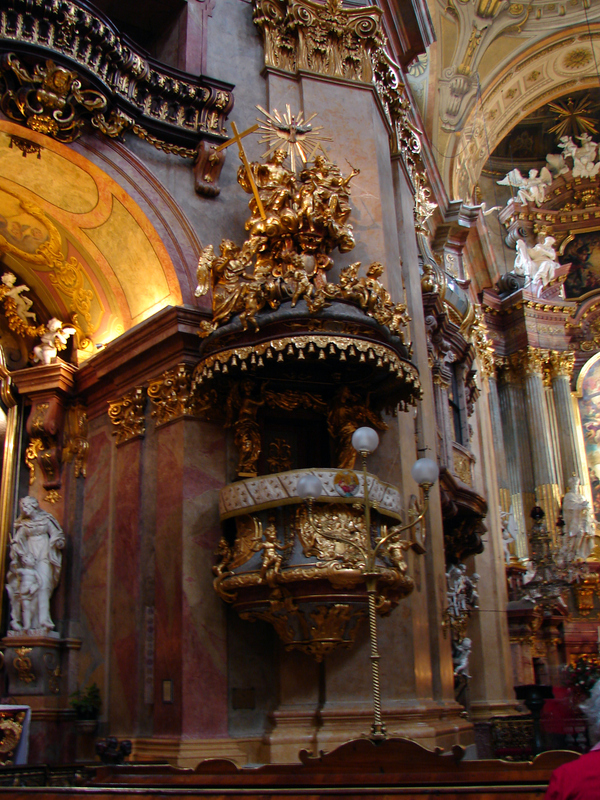 To the right of the altar is the spectacular gilded pulpit, crowned with a gold-and-silver representation of the Martyrdom of St. John of Nepomuk, sculpted by Lorenzo Mattielli. Above them on the canopy, sits the mother of God. The faces and expressions on the sculpture are so powerful and those precious metals seem to have such governance over the viewer. On either side of the altar are the side chapels with paintings of the Holy family (left) and St. Michael (right). In either are glass coffins which contain martyrs from the Roman catacombs, dressed in full Roman regalia. Even the pews in the church are decorated, the ends carved with expressive cherubic heads. 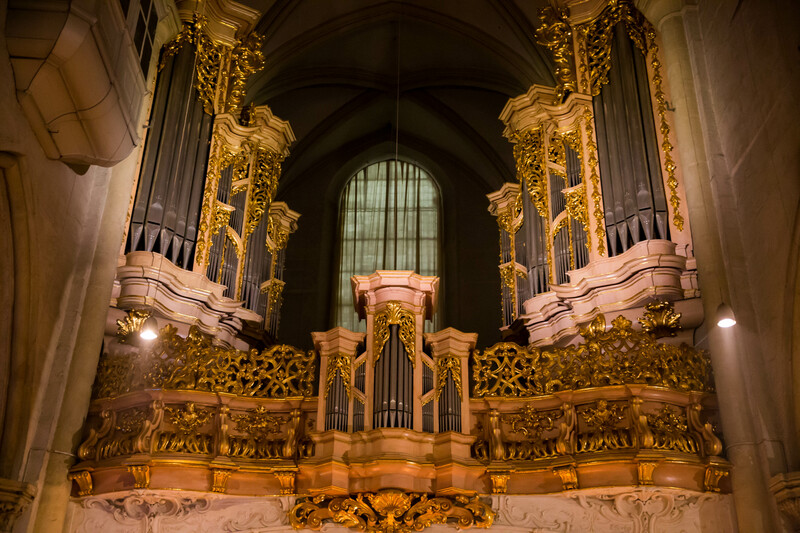 As you walk out of the church, take a moment to study the baroque organ built in 1751. Cafe Demel is the closest thing to walking into Maria Antoinette's bedroom youll ever find outside of Versaille. Luxurious dark wood with Neo-baroque patterns adorn the walls. Golden chandeliers with crystal petals hang from the ceiling and antique mirrors reflect back from every angle beautiful cakes and pastries hiding behind glass cabinets. Demel was established in 1786 and ever since has served Vienna the most mouth-watering pastries and chocolates. The white-aproned waitresses help the customer pick out their treats. The chocolate comes in some of the most stunning packagings, and although are rather expensive, they make a unique gift which will be treasured by whoever receives it. Beside Demel is the MANZ bookshop. MANZ has stood here for over 100 years selling mainly judicial literature. Today, it is a landmark not for its literary selection but its iconic art deco portal, designed in 1912 by Austrian architect Adolf Loos. 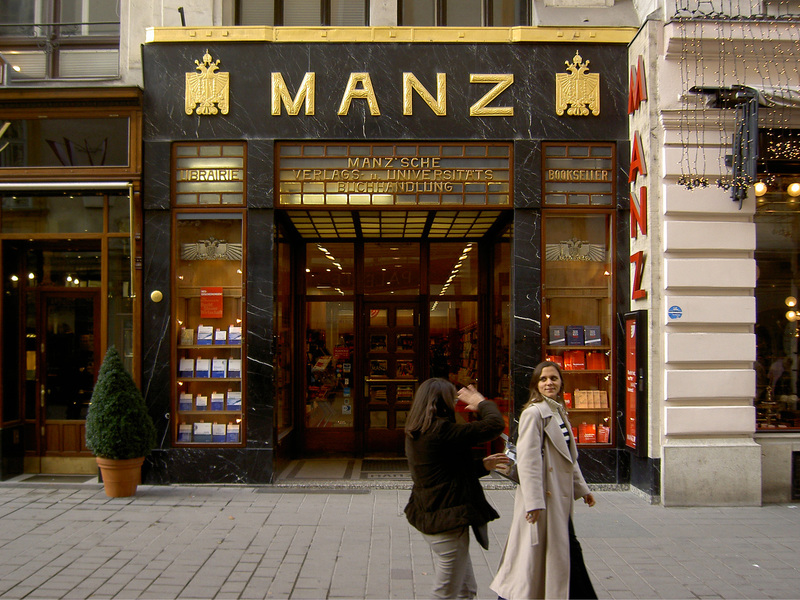 The Looshaus was designed by the same man who created the MANZ bookstore and constructed only a year before. But unlike MANZ which received overwhelmingly positive reviews, the Loohaus was considered too modern in 1911. Vienna was a baroque city which loved ornamentation, and the Loohaus was simplistic, geometric and contemporary. Although it took the public a long time to come around to this form of design, today it is viewed as a groundbreaking piece of art design architecture which helped push the movement forward in Europe. Michaelerplatz is a large square which separates the rest of the city from the Hofburg Palace, the former imperial court of Vienna. The enormous Michaelertor, the gate into the palace, dominates the square. Its masterful roman columns seem to swell like the crashing of the waves over the rest of the square. In the centre of the square, you can view an open area which has been preserved with the remains of Roman and Medieval foundations of the square which once stood here hundreds of years ago. On the opposite side of the Michaelertor gate is Michaelerkirche. The Michaelerkirche is an amalgamation of various architectural styles, the original medieval structure was built in 1221, the current facade built in 1792 is neoclassical and the tower, from the 14th century, displays many iconic elements of Gothic architecture. Walking inside, you'll be immediately struck with awe upon looking at the swelling, high altar. Designed in 1782 by Jean-Baptiste d’Avrange it is one of the most majestic stucco sculptures from the Rococo period. The piece features the story of the Fall of the Angels and includes the Archangel Michael of which the church is named after. Clouds burst from the walls and a golden sunburst beams from the ceiling. Angels and cherubs fall to the ground from above. On the lower sunburst is the altar of Maria Candia, a Byzantine icon of the Virgin Mary. The other iconic piece of design worth studying inside is the gilded pipe organ from Johann David Sieber. 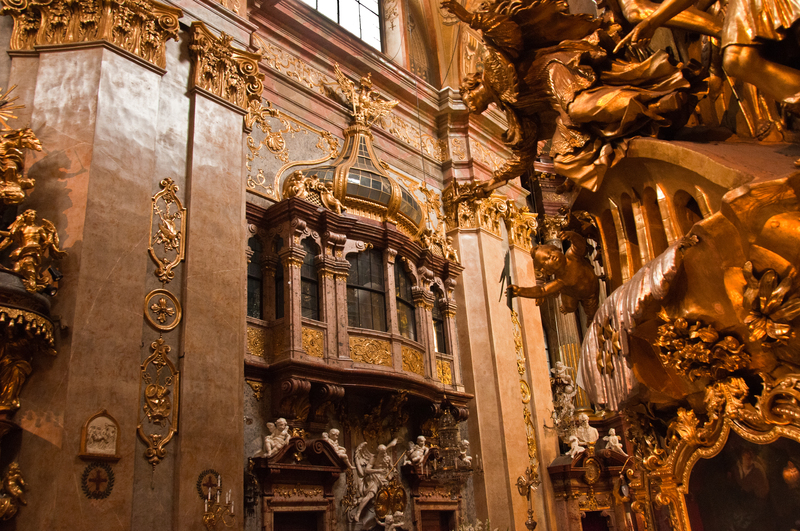 This is the largest baroque organ in Vienna. As you first gaze up at the centre you might not think it looks that big but look to the left and the right and observe the GIANT organs on either side of the smaller central set of pipes. The unfinished Requiem by Mozart was first performed here in 1791. 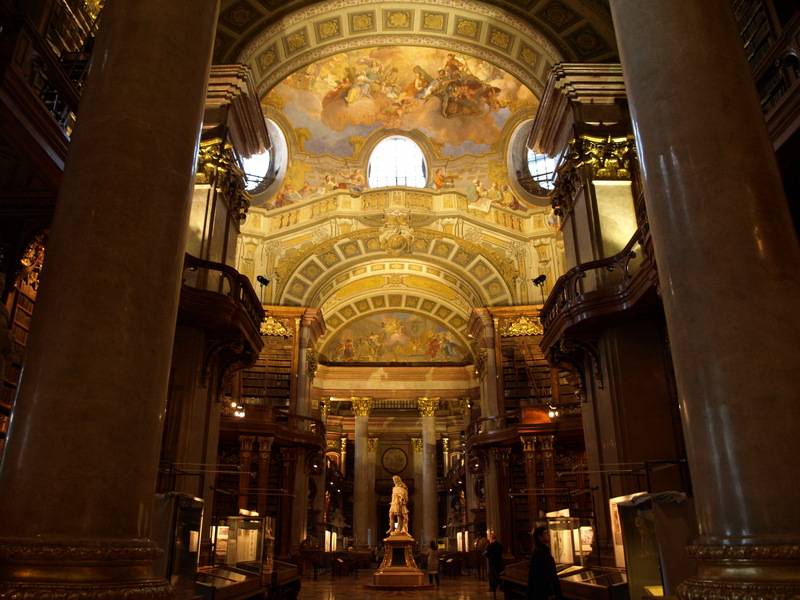 The Austrian National Library is older than some modern nations. The library dates back to 1349 and contains some of the most impressive collections of medieval literature across Europe. Although the 7 euro entry fee into the library might seem steep for entry into, basically one big room, trust me, this is one big room you don't want to miss. 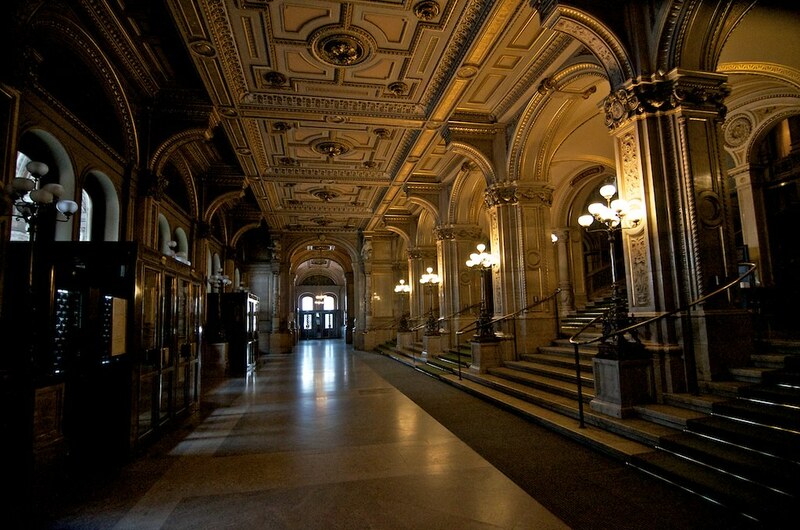 Walking into the Grand Hall, you're met right away with a breathtaking scene. You feel like you're inside a cathedral with the massively high ceilings, doomed rooftop covered in frescos and enormous marble columns. But the important part of the room are the glossy amber shelves holding precious paper treasures. This history of Heldenplatz is a sordid one. Heldenplatz or Heroes' Square is a large public area in front of the Hofburg Palace. One of the darkest parts of this square's history is its use in Adolf Hitler's ceremonial announcement of the Austrian Anschluss to Nazi Germany on March 15th, 1938. The square is the perfect place to get an incredible shot of the Royal Castle which sits across the square. 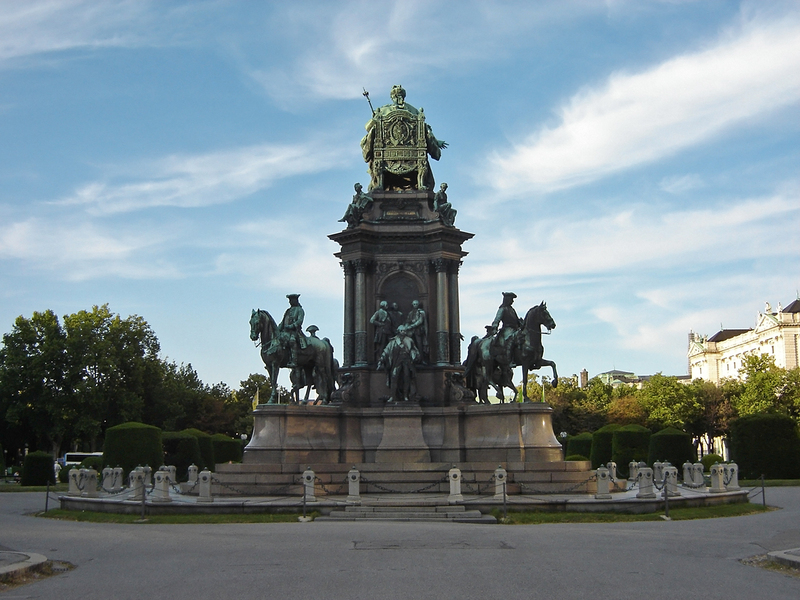 In the centre of the square stands the statue of Archduke Charles of Austria. The statue was installed in 1860, and was meant to lift the spirits of the people up after their defeat in a bloody battle. The horse he rides on is rearing up as this is a symbol of military glory. Another equestrian statue in the square is that of Prince Eugene of Savoy designed in 1865. Walking west along Heldenplatz Road you will come to another grand square; this one is the Maria-Theresien-Platz or Empress Maria Theresia Square. 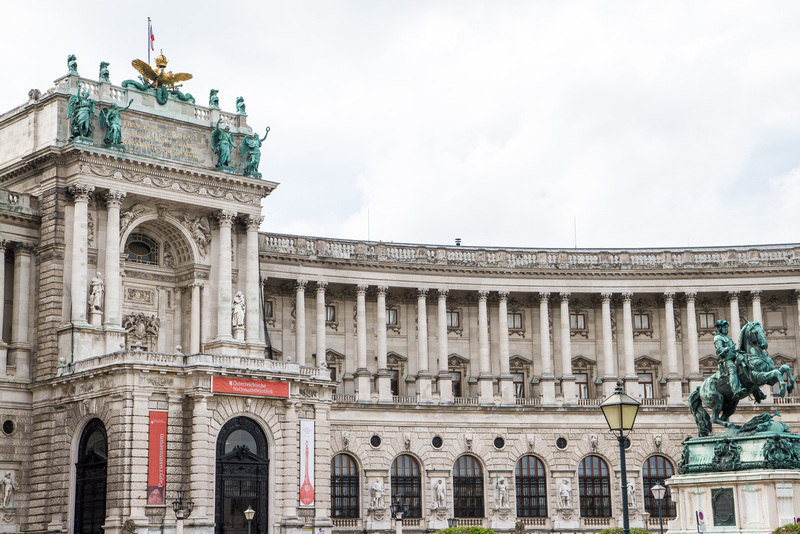 On either side of the square are two near-identical buildings, one is now the Natural Museum of History and the other the Art History Museum of Vienna. In the centre of the square is a large statue of Empress Maria Theresa, her hand outstretched towards the people below. She is surrounded by variously armed calvary surrounding the round statue. The square itself is decorated with simple yet aesthetically pleasing green shrubs and bushes carved into perfect round nodules. This charming tavern has been located along the Operngasse for hundreds of years, and the new owners wanted to continue its excellent legacy. Today this tavern serves up dozens of local and international beers and down-to-earth Viennese specialities. 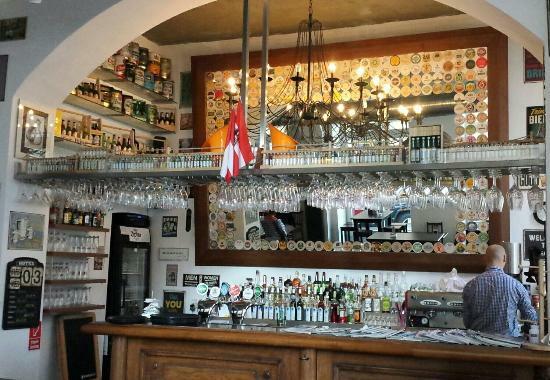 The walls are covered in beer memorabilia from over the years and sitting inside makes you feel like you're more in a museum than a restaurant. If you want a down-home taste of Vienna, be sure to order the veal schnitzel, this gigantic fried piece of meat is served alongside a traditional helping of cranberry jelly, fried potatoes and a salad to make you feel like you're offsetting all that fried goodness. Newer PostIt’s Okay to Be a Tourist.